Bangladesh is world’s one of the largest delta of three major river system i.e. the Ganga, the Jamuna and the Brahmaputra. Water resources are considered as bless of the Almighty for Bangladesh. There is enough land with all essential physico-chemical parameters available for agricultural activities especially for aquaculture. Though Bangladesh is densely populated, the demand of animal protein is high. So, demand of fish is increasing day by day because about 58% of total animal protein is contributed from fish (Ref). Without ensuring a good aquaculture production, it is not possible to meet the demand of protein of people. Fish production can only be the sustainable sources to deduct malnutrition. People of Bangladesh are fond of fish as their first choice of animal protein food. To fulfill the demand and expectation of people, aquaculture practices have to be expanded. Fish production mainly depends on aquaculture which contributes about 48% of total production (Ref). Fish culture is extended through the country consequently the demand of fish seed is increased. In Bangladesh, freshwater aquaculture systems mainly revolve around the polyculture of various species of carps (both Indian and Chinese carps) and in varying combinations and densities depending on the availability of seed throughout the country (Hussain, 2009). Only a reliable induced breeding and fry rearing technique can ensure a steady supply of quality fish seeds (Mollah, et al., 2008). There are about 985 hatcheries in our country, where 873 are private and 112 are public one (DoF, 2009). About 98% of total seed is contributed by hatcheries and only 2% comes from natural sources (Ref). Private sector hatcheries and nurseries, particularly hatcheries and fry nurseries operated by farmers constitute a significant source of fish seed which far exceeds the natural sector contribution (Phillips, 2002). So, expansion of aquaculture is directly dependent on hatchery seed production. Artificial propagation is the main means of fish seed production (Kimleang, 2004). Most of the hatcheries perform their breeding by using Pituitary Gland (PG) and Human Chorionic Gonadotropin (HCG) doses, production and price of which are not at considerable level. 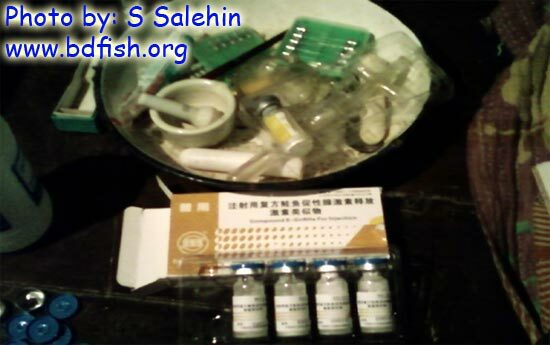 In these circumstances, alternative hormone/inducing agent like Compound Salmon Gonadotropin Releasing Hormone analogue (S-GnRHa/OvaprimTM) is introduced in Bangladesh to enhance fish seed production. Ova prim is popularly used in inducing ovulation and spawning in freshwater fishes (Makinde, 2001). The major species of aquaculture in Bangladesh are the Indian carps namely the catla (Catla catla), the rohu (Labeo rohita), the mrigal (Cirrhinus cirrhosus) and the kalibaush (Labeo calbasu) (Rahman, 2005). Induced breeding of Hypophthalmicthys molitrix, Labeo rohita, Catla catla and Barbados gonionotus can be conducted for commercial seed production using Compound S-GnRHa/OvaprimTM (Salehin, 2010). It is used for breeding of these fishes as alternative of PG and HCG and is most commonly used for commercial breeding purpose. Quality and availability of PG and HCG are drastically reduced due to lack of producers and importer who produce and supply this type of hormone throughout the country. For this reason, price of PG and HCG are rising day by day. Hence, the farmers and hatchery operators are looking for cheap inducing agent and introduce new hormone with reasonable price, high quality and easily available. Though S-GnRHa is imported product, but the price is cheap and is available everywhere of Bangladesh even in small town surrounding fish hatchery and farm. Production of one kg fry can be done with about 1.76 times less cost as it required in hatchery operation by using S-GnRHa/OvaprimTM in lieu of PG and HCG (Salehin, 2010). In natural spawning, nerve cells in the brain deliver GnRHa to pituitary gland. The GnRHa serves to liberate gonadotropins from pituitary cells. Then gonadotropin influence maturation of the gonad through gonadal steroid hormones. OvaprimTM contains an analogue of salmon GnRHa and a brain neurotransmitter (dopamine) inhibitor. The GnRHa elicits the release of stored gonadotropins from the pituitary. The dopamine inhibitor serves to remove other inhibition of GnRHa release. 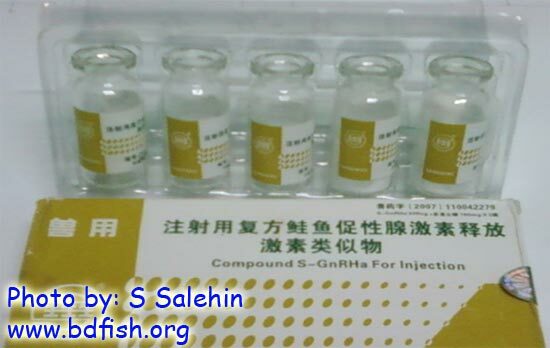 The outcome of using GnRHa is a burst of maturational hormone from pituitary that induces final maturation of the gametes via endogenous gonadal steroid hormone. These steroid hormones are essential for final gametes maturation. 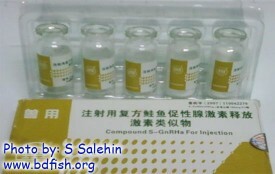 When S-GnRHa is used during in breeding, the GnRHa analogue immediately promotes the release of steroid gonadotropins from pituitary without affecting viability or fecundity of fishes. Thus time required for breeding is redacted and ovulation rate is increased. Now, it can be concluded that breeding using S-GnRHa/ OvaprimTM give better result and highly acceptable to the field level. Considering all these advantages it is necessary to investigate and find out the best operating and management suites in breeding fishes for commercial seed production by using Compound S-GnRHa for sustainable development of aquaculture in Bangladesh. DoF (Department of Fisheries). 2009. Matshya Saptah Shankalon. Published by Matshya Adhidaptor, Ministry of Fisheries and Livestock, Dhaka, Bangladesh. 108 pp. Hussain, M. G. 2009. A future for the tilapia in Bangladesh, AQUA Culture AsiaPacific Magazine, p38-40. Kimleang, I. 2004. The impact of improved fisheries production and fisheries products on Cambodia’s fisheries and economy. Royal University of Agriculture, Phnom Penh, Cambodia. (M.Sc. Thesis). 99 pp. Makinde, O.O., 2001. The impact of artificial breeding of cultivable fish species in Nigeria. University of Agriculture (UNAAB), Department of Aquaculture and Fisheries Management) Abeokuta. Seminar paper (September), 23 pp. Mollah, M.F.A., Amin, M.R., Sarowar, M.N., and Muhammadullah. 2008. Induced breeding of the riverine catfish Rita rita, J. Bangladesh Agril. Univ. 6 (2), 361–366 pp. Phillips, M. J. 2002. Freshwater aquaculture in the Lower Mekong basin. MRC Technical Paper No. 7. Phnom penh, Mekong River Commission. Rahman, A. K. A. 2005. Freshwater fishes of Bangladesh. 2nd ed. Zool. Soc. Bangladesh, Dhaka, Bangladesh. 394 pp. Visited 2,298 times, 3 visits today | Have any fisheries relevant question?